The sunshine vitamin, Vitamin D is produced by the body on exposure of skin to sun. Staying indoors, having milk allergies, or following a vegan diet can cause a deficiency of vitamin D. This vitamin has vital role in stregthening the bones as it helps the body absorb calcium from foods. 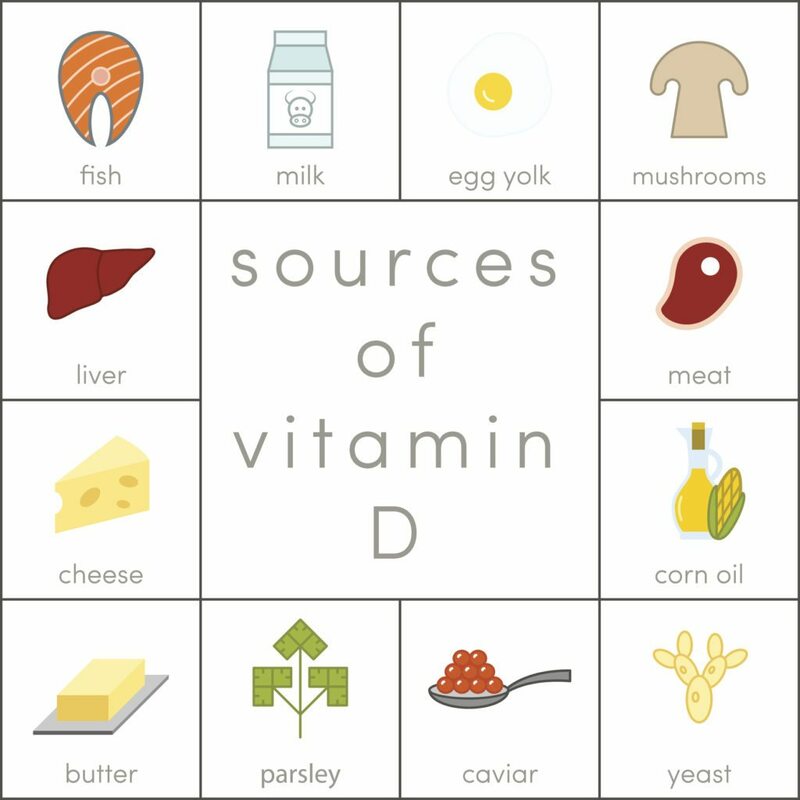 Some sources of Vitamin D are shown in the picture below. Vitamin D is essential for bone metabolism and absorption of calcium in the body. The deficiency poses women particularly to an increased risk of fractures because of low bone mineral density. Although it is difficult to know tha actual cause of muscle pain often, it can indicate a deficiency of vitamin D. A study showed that 71 % people suffering from chronic muscle pain had a deficiency of vitamin D.
Hair loss is another problem faced by people lacking in vitamin D. Severe hair loss indicates nutrient deficiency in the body and should be treated although some hair loss is also related to stress factors. Alopecia areata is a disease that causes severe hair loss and is associated with soft bone causing disease called rickets. Vitamin D deficiency has also been linked with depression. Some studies have shown improvements in mood if the levels are improved after taking a supplement. Vitamin D deficiency slows down the healing process of wounds as vitamin D is responsible for formation of new skin production. Also, the body’s healing ability is affected if the body is unable to fight off infections and inflammation. Lower back pain and bone pain are common symptoms of vitamin D deficiency as lower levels of the vitamin can make the absorption of calcium inefficient. The likelihood of suffering from leg pain and joint pain increases twice if you have a deficiency of vitamin D.
Feeling tired can indicate many causes including vitamin D deficiency. Low levels of Vitamin D in the blood can make you suffer from tiredness and have a negative impact on your life. Blood levels of lower than 20 ng/ml show a vitamin D deficiency which should be treated with help of a supplement. However, people having levels in between 21 ng/ml and 29 ng/ml also reported fatigue often. Vitamin D has a vital role of strengthening the immune system and fight off infections. Not being able to do so signals a deficiency of this vitamin in the body. Vitamin D is involved in vital functions such as calcium absorption, strengthening the immune system, strengthening of bones, muscles, and heart. Although there are a few foods containing Vitamin D, it is mainly produced by the skin’s exposure to sunlight. The cause of vitamin D deficiency can particularly be limited exposure to sunlight. Also, dark skin unables vitamin D production because of the melanin pigment. People may also face a deficiency as they age if the kidneys do not convert vitamin D into its active form. Natural sources of vitamin D are mostly animal based which is why vegan people can have a deficiency of vitamin D. Moreover, digestive diseases can also cause insufficient absorption of vitamin D in the body. Also, obese people can have this deficiency. A blood test can help in the diagnosis of vitamin D deficiency. Blood levels in between 20 ng/ml and 50 ng/ml are adequate whereas below 12 ng/ml indicates vitamin D deficiency. A healthy diet containing sufficient Vitamin D and suplements can help in treating the deficiency. Also, you should spend some time exposing skin in sunlight.